Hello, everyone! Welcome to my blog! For the fall semester of 2018, I am participating as a student in the Beijing Center (TBC), a study abroad program based in Beijing’s University of International Business and Economics, or UIBE for short. I’m so excited to bring all of you along with me through this amazing experience studying abroad in Beijing, China. That being said, it has already been a solid three weeks since my arrival in China. I know. It’s already been three weeks. In that time, I’ve already taken over 1,000 photos, stumbled through (and I mean, really stumbled through) some survival Chinese, eaten twice my weight in a bunch of different foods, and seen some pretty darn cool things. But I’m getting ahead of myself. Let’s just recap my first week in Beijing. In the week leading up to my departure date to Beijing, I felt a huge variety of emotions. Anyone who asked me how I was feeling about leaving to study abroad got the same general answer. I felt excited, eager, anxious, nervous, and, honestly, a little bit scared. This would be the first time I was going to be away from home for more than a few weeks. Granted, I had participated in an exchange program to Japan in the past, but that was only for two weeks. This time, I would be gone from home for four months. That’s quite a long time, and as the departure day crept closer and closer, the realization that I would be on the other side of the world for an entire semester hit me pretty hard. Especially when I was standing in the middle of Chicago O’Hare International Airport on departure day. Me all ready to go to board my flight to Beijing! Let me tell you, the picture shown above is a little misleading, as it was taken before the tear fest happened. When I say tear fest, I mean tears streaming down my cheeks as I said my goodbyes to my family. I mean I made my brother’s t-shirt damp with my tears when I hugged him as he wished me an amazing study abroad experience. I mean my mother telling me to stop crying even though she was clearly crying herself. I continued to cry well after I said goodbye; I had to go through airport security and then find my departure gate with my vision blurred by tears. I’m pretty sure the cash register at McDonald’s was wondering if my eyes could get any redder when she was taking my order for some chicken nuggets. The chicken nuggets soothed me for a little bit before I got onto the plane and the crying started all over again. But, as much as I did cry, I boarded my plane and somehow managed to lift my 40 pound carry-on luggage into the overhead compartment by myself. I hope whoever witnessed that struggle had a good laugh (I’m 4’11”, by the way). 13 hours after taking off, I landed in Beijing, China, on August 12th. The very first night in Beijing was, admittedly, pretty rough. I had barely slept on the plane, maybe about 2 hours near the end of the flight. I had spent most of my time anxiously thinking about the upcoming semester while playing my 3DS, doodling in my bullet journal, or just blankly staring out the airplane window. But finally getting off of the plane gave me some energy to perk up. 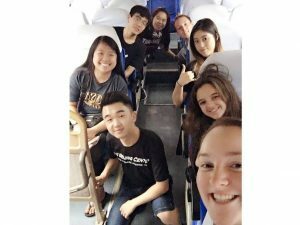 Not long after getting off of the plane, I quickly befriended two other students who were on the same plane and were also participating in TBC’s program. 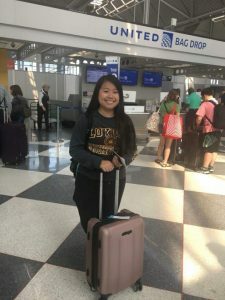 The relief that no doubt all of us felt was liberating; most of my anxiety about the flight to Beijing stemmed from the fear of getting lost after getting off of the plane. At least with my newfound friends, if we got lost, we would be lost together. And so, we made our way through Beijing Capital International Airport. 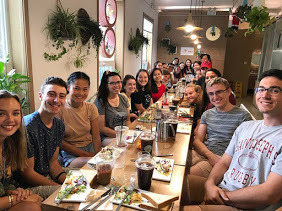 After getting through customs, we were greeted by a group of Chinese UIBE students who worked for TBC as Chinese roommates and were taken to a cafe to rest as we waited for the rest of the students who were arriving the same day. At this point, my energy was fueled by nothing else but the excitement of finally being in China and the enthusiasm of meeting people involved in TBC. I remember having a lot of lively conversations with both the other TBC students and the Chinese roommates present, even though we students were all exhausted from the plane ride. On the way to UIBE’s campus from the airport! Once we finally got on the bus to go to UIBE’s campus, however, I think we all crashed. I know I did. Most of the rest of that night was spent in an exhausted haze. I remember everyone being extremely kind and patient with all of us who had just arrived, and I remember being really overwhelmed with so much new sights and information. TBC had graciously fed us dinner, and I recall being completely out of it, unable to bring myself to eat much because I was so exhausted. I remember finally going to bed feeling completely unsure of what I had gotten myself into. But, the next morning, I quickly figured out that all of my emotions from the night before were a result of travel exhaustion. We had breakfast in a cute cafe and were able to socialize with each other more. I felt much better, and everyone was so open and kind to each other. It was obvious that morning that the excitement for the upcoming semester was contagious, all of us feeding off of each other’s energy. The first of many group photos. Can you find where I am? Then, Beijing Center’s orientation week finally kicked off. Throughout the week, most, if not all, of our burning questions were answered. 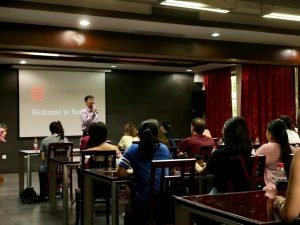 We went over everything from living in Beijing as a UIBE student, navigating the campus, talking about the logistics of academics, and more. We also met all of the amazing TBC staff as well as the Chinese roommates and got to know one another better through group activities. We even were grouped together with Chinese roommates to go out to lunch and to dinner so that we would know food places around campus. It was such a clear, scheduled, organized way to get us orientated in Beijing. One of many orientation sessions during orientation week. In addition to the orientation sessions, there were a handful of excursions that we went on. 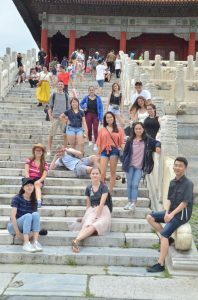 We went sight-seeing at Tiananmen Square, we saw an amazing acrobatics show, and we went shopping at Aegean mall in preparation for our upcoming Silk Road trip. Every day, I had so much fun, laughing and smiling with my newfound friends, and the stress of the first night in Beijing seemed to just melt away. 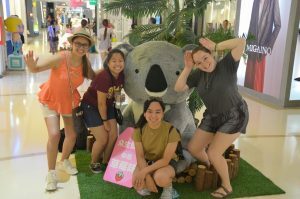 Cute giant koala at the Aegean Mall! All in all, the first week might have started out a little rough, but after getting over the initial feelings of being overwhelmed and exhausted, I became much more comfortable. I was so relieved to realize that so many other fellow students were in my shoes. 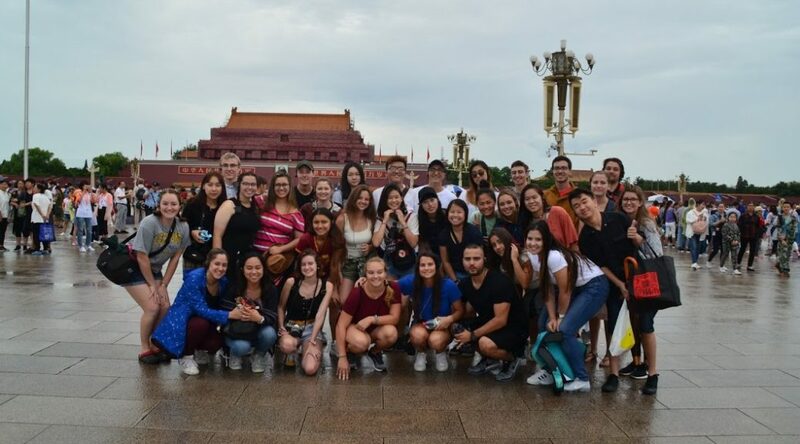 I was glad that we all shared the feeling of being in this wonderful experience together, and this feeling brought us even closer together when we all packed our bags and left for a once-in-a-lifetime journey along the Silk Road, a journey that would take us over 2,000 miles away from Beijing. But more on that trip next time!